CNET reports on a research note from RBC Capital Markets analyst Doug Freedman claiming that Apple appears to be accelerating its plans for the second-generation iPad mini, although it remains unclear when Apple is looking to launch the device. RBC Capital Markets analyst Doug Freedman -- who is in China visiting chip companies this week -- offered this ambiguous Apple note: "iPad Mini Gen-2: Apple's gen-2 iPad mini is getting pulled-in, and is likely to have several new suppliers, with TXN gaining content." "Pulled in" would seem to imply that Apple is moving up introduction of the next iPad Mini. That would be helpful if we knew when the gen 2 Mini was actually slated to ship in the first place. 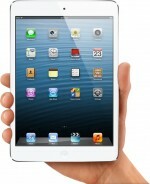 As the current iPad Mini is still in short supply, we may be getting a little ahead of ourselves. Apple introduced the iPad mini just under two months ago, and the company is still quoting one-week shipping estimates for new orders through its online store as supplies are expected to remain tight into 2013. One of the most significant criticisms of the iPad mini has been the lack of a Retina display as found on the full-size iPad and on smaller devices like the iPhone and iPod touch. There has been a fair amount of discussion about just when Apple will add a Retina display to the iPad mini, depending on when technology allows the company to include the feature without too much in the way of price, size, or weight concessions. One rumor has claimed that Apple will indeed be including a Retina display in the next-generation iPad mini rather than waiting for a third-generation model at a later date. Good. I'm waiting for the retina display to consider purchasing one. I actually got one (WiFi 32GB model) last Saturday after comparing it to the iPad 4. I didn't see any annoying diference in performance between the two of them when I used the demo versions side by side, and the retina display is not a that big a deal -at least for me. Its portability, usability and looks are what made me opt for it... it's a great device. Same. Basically only thing holding back most people is the lack of Retina. Get that and it's pretty much game over for the Kindle HD. The Mini demands low price, high battery life, and a small LIGHT battery. Retina (and the associated GPU power needed) goes against all of those. And all that will be solved! I want it bad. But I expect it’s a 12-18 month solution, not a 6-month solution. The next Mini will not be retina, I don’t expect. Would love to be wrong! When it does happen, I expect the non-retina Mini to remain as well, at a new lower price point, as Apple has done with the iPad and iPhone. Got one for Christmas, still waiting to see whether the screen is as big an issue as reviewers have made it. If so, I'll sell it when the Retina screen comes out. I still think the price on this Mini with an 18 month old processor and non-Retina screen should have been $299. Lucky bum! I’m really tempted by a Mini + keyboard-screen-cover (some on Amazon are well-reviewed) for certain tasks. But I demand 128 GB or I won’t replace my current iPad. But if the Mini today had the faster chip and display you want, it would either be thicker and heavier or get worse battery life. Apple’s choice of chip and display will give you real benefits, so enjoy them! Later, you’ll be able to get the display/chip you (and I) dream of AND have today’s same battery life... but of course, even faster chips will be out then. There’s no escaping that for a given battery size, a faster chip gives you fewer hours, and therefore the Mini will not likely ever get the fastest chip: it would be the wrong choice for the device. My wife wants one. I told her, "why when we have an ipad2 already ?" She agreed. I told her when they get faster or a better screen. The resolution is very good on the iPad mini without a retina display. Don't wait - just buy this beautifully crafted device and enjoy now. Everyone without a tablet that I have shown mine too also want an iPad mini. If they made a retina iPad mini the new resolution would demand updates for all existing apps like the iPhone/iPod 5 did. I'm not too fond of many different resolution screens for different devices like many manufacturers are. A Retina mini would be the same resolution as the iPad 3rd and 4th generation so the apps would run at the same resolution just smaller. I've learned long ago that the tech press gloms onto some missing feature and it becomes all they want to talk about. Retina display for the mini is appealing to some but the numbers are far less than what we read about. When Apple delivered Retina display it wasn't because the general populace was clamoring for better screens. I think Retina is important in the long term because web and software design is becoming more complex and rich but Retina isn't a dealbreaker for many. In fact weight was far more of an issue for many of my friends and family that wanted an iPad for reading. Got one for Christmas, still waiting to see whether the screen is as big an issue as reviewers have made it. The problem with the iPad mini is that it was released before it was fully buzzword compliant. Hey! I'm an analyst! Listen to me! In all seriousness, when was the last time one of these so called "analysts" got anything right that was Apple related?